Democratic lawmakers and critics are accusing President Donald Trump of inventing a border crisis to justify a wall. John Sandweg, former acting director of U.S. Immigration and Customs Enforcement under President Barack Obama, said on CNN that the wall is unnecessary, because the Border Patrol already catches most people trying to sneak across the border. “And, currently, on most of the border, you’re looking at a 90 percent-plus apprehension rate, meaning if you cross that southwest border unlawfully, over 90 percent chance you’re being apprehended,” Sandweg said Jan. 8. Sandweg, who served as acting ICE director for several months in 2013-14, didn’t elaborate on the statistic during the interview. More often, we hear politicians and pundits refer to the sheer number of border apprehensions. Apprehensions at the southwest border continued a years-long decline in Trump’s first year, dropping to about 304,000 (factoring in a few months of Obama’s tenure). Apprehensions increased to about 397,000 in fiscal year 2018, which is still well below the high level in 2000. Now we’re investigating something different: How many border-crossers make it past border agents into the country? Turns out, that’s very hard to know — something the federal government even acknowledges. Sandweg’s immigration law firm directed PolitiFact to a 2017 report by the Department of Homeland Security as well as other federal government reports. But available data and expert feedback suggest Sandweg’s 90 percent apprehension rate could be an overstatement. Because of the uncertainty, we wanted to explain what we know without rating this claim on the Truth-O-Meter. Let’s start with a 2017 Homeland Security report. The department found that between 55 to 85 percent immigrants crossing the border illegally were apprehended or interdicted in 2016. That’s an increase from a decade ago, when the rate was between 35 to 70 percent. The department calculates the border apprehension rate a couple of different ways. It’s important to keep in mind that each method has limitations, and its conclusion should be interpreted broadly. The federal government acknowledges that it is difficult to precisely quantify these figures. A hard number for successful border crossings is unknowable. So the apprehension rate is calculated with migrant survey data, mathematical models and border patrol agent assessments of people who were stopped and others who got away. There is other data that partly supports Sandweg’s point, though it is outdated. His law firm mentioned a 2014 report by the Congressional Research Service. 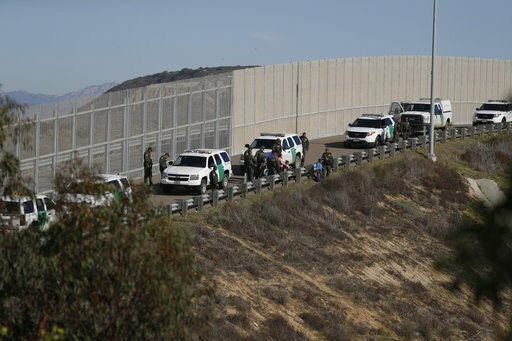 It cited a Government Accountability Office analysis of Border Patrol metrics, which found eight out of nine Border Patrol areas showed improved effectiveness rates between 2006 and 2011. Some areas achieved what the federal government called a Border Patrol Effectiveness Rate of 90 percent, or in the ballpark. According to the report, the effectiveness rate is calculated by dividing apprehensions and the estimated number of people turned back by the estimated known illegal entries. We interviewed six immigration experts for this story, and none knew of any evidence supporting a 90 percent apprehension rate. Some were more critical than others. However, he said, the government has improved the apprehension rate over the past decades. Isaacson credits additional fencing, fewer Mexicans attempting to make the journey, and the addition of more border patrol agents. The large range of 55 to 85 percent that is available publicly makes it hard to evaluate, said Steven Camarota, director of research for the Center for Immigration Studies, which advocates for low levels of immigration. David Bier, an immigration policy analyst at the libertarian Cato Institute, said the 85 percent figure — the high point in the report — is a better figure because it includes a larger population of illegal border crossers rather than a subgroup. “It does seem like the majority of people who are crossing the border now are doing it to turn themselves in (seeking asylum),” he said. Princeton University sociologist Douglas Massey, co-director of the Mexican Migration Project, a collaboration among a few universities to track migration, disputed Sandweg’s claim more forcefully. Massey said the probability of apprehension for an undocumented immigrant crossing the border has never risen above a 40 percent chance since 1965. In 2016 (the most recent year with data) it was about 20 percent. Massey’s project uses a different methodology than other methods cited by the federal government. This measure is based on interviews with households in Mexico about their trips to the U.S. as well as interviews with Mexican migrants in the U.S. The probability of apprehension in any given year is the number of apprehensions in that year divided by the number of attempts observed in that year. Massey disputed the federal government’s methodology, including the numbers that come from Border Patrol agents. “While they might observe someone going back across the border or getting away from them, the total numbers of people who are actually deterred or escape without apprehension are ultimately unobservable,” he said.